Home / PPC Articles / Facebook ads vs Google Adwords – Where do you spend your budget? 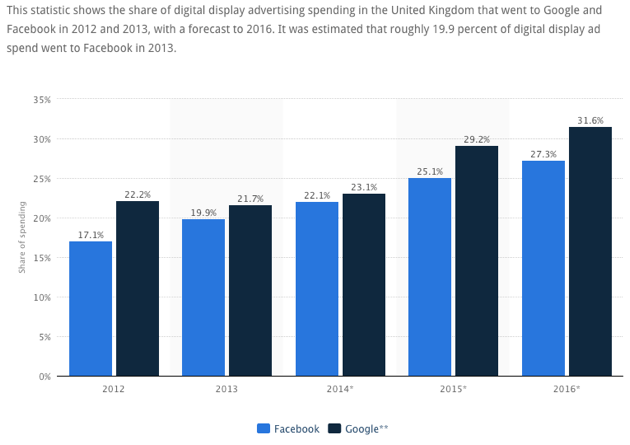 Facebook ads vs Google Adwords – Where do you spend your budget? Google Adwords is no longer the only serious player when it comes to PPC advertising, it has a giant competitor that is ready to challenge Adwords and this is no other than Facebook Ads. The two companies can give their ‘fight’ for the market share but what is important for you, the advertiser, is where and how you spend your advertising budget for maximum ROI. Google is responsible for the growth of PPC and PPC has played a big role for the growth of Google to the size it is today. Google was the first company that looked at PPC seriously and took advantage of it by utilizing its huge user base of people either searching on Google or browsing the thousands of websites that have Google Ads enabled (that’s Google Adsense). Facebook on the other hand with 1.49 billion active users per month could not leave this opportunity go wasted. With all the demographic information that has for all of us, it has a big advantage over other advertising companies. Facebook knows what we like (and soon what we don’t like), what our friends like, the pages we interact with, our relationship status, education, where we live and many many more details. So, on one side we have Google that knows ‘what we want’ and Facebook on the other side that knows ‘what we do’. What does this mean for advertisers and where do you put your money? It will be easier to answer this question by explaining the primary use of each network and the costs associated with facebook and google advertising. When to use Google Adwords? Adwords is essential for business growth. If you avoid mistakes that can drain your budget, it can become a very profitable sales channel for almost any kind of business. Why is that? Because of Google. Anyone using Google search (or any other products i.e. YouTube), is either looking for information, answers to questions or products and services to buy. This simply means that users have a ‘clear intent’ and a good idea on what they are looking for and they use Google to find it on the Internet. If you are selling products, services or even information that people search for, then Adwords is the right channel for you. You can reach people searching on Google, Partners and the Google display network (websites using adsense). You can use keywords to control when your ads should appear or you can use dynamic search ads or Google shopping campaigns to advertise your products without worrying about keywords. It has a very powerful and flexible platform which gives you a number of options to optimise your campaigns and spending. Adwords is immediate in the sense that if you have a good product and advertise it to the people looking to buy it, you can make sales. 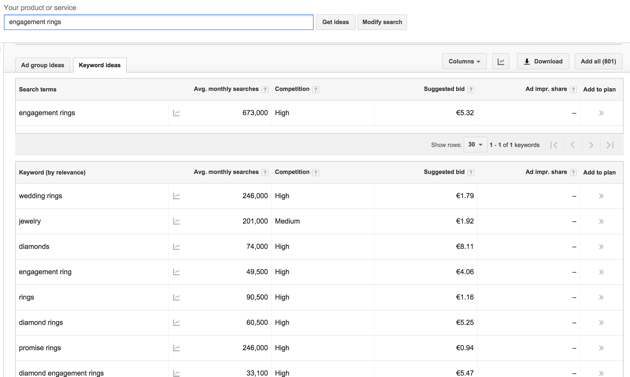 You can now do remarketing with adwords both on Google Search and Display network. If you already have good organic rankings, you can use adwords to make your search presence even stronger. When people click on your adwords ads, they go directly to your website. When to use Facebook Ads? Facebook and facebook ads are also a sales channel but that’s not their strongest area. They are more suitable for brand awareness, spreading the world, winning the social proof game, networking and connecting with your audience. When you login to Facebook, your primary concern is not to find something to buy or to search for information but to see what your friends are doing, read news and interact with them. The fact that facebook will show a bunch of ads in your timeline, that does not mean that it is something you want, even though sometimes you may find it interesting and like it. If you are a startup, small business owner, publisher, event organiser, non-profit organization and want to quickly spread the word or build an audience, facebook ads is the place to start. You can do retargeting and connect with people that visited your website from facebook or lookalike audience. It’s a great marketing tool especially when it comes to raising awareness. You can use facebook ads to get ‘likes’ for your business page, visits to your website or sales. There are a number of ways to define how you want to be priced for your campaigns. Where do you spend your money on Google Adwords or Facebook? There is no way to know in advance which is the most cost effective platform to use for your products and let me explain with an example why. Let’s assume that you sell engagement rings and you want to find out which channel to use. By definition both facebook ads and adwords are perfect for your product. A lot of people use Google to search for engagement rings to buy and a lot of people use facebook to prepare for their engagement and wedding. So, there is a great audience in both networks, your products are both visual and marketable and suitable for selling online. Before setting up your campaigns you do a quick research using the google keyword tool to find out the average cost per click which is between $2 – $6. 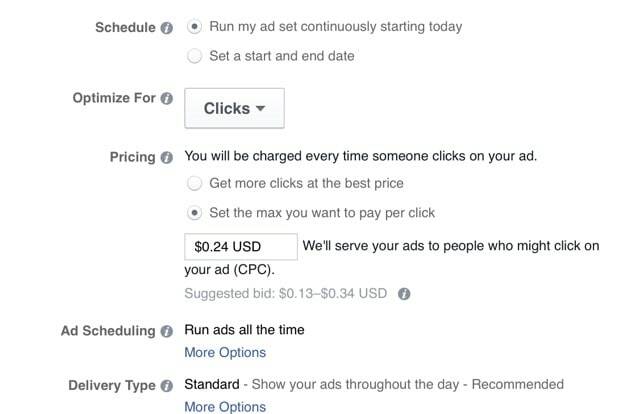 So in average you will pay $4 for every click on your ad. If you setup your campaign on Facebook and optimise it for ‘clicks’ the values are between $0.13 and $0.34 (i.e. the average is $0.24), if you set it up for ‘conversions’ the average goes to $9 per conversion. As you can see the results are different and not comparable. The fact that the average cost per click on Facebook is only a fraction of Google adwords, does not mean that the end result (i.e. the actual cost per sale), will be less in Facebook. Why is there such a difference in initial cost? Google knows that engagement rings are products that are sold online, they know how many people search for the products, they know how many ad positions they have and they also know how many advertisers are available and this helps them set this price (Adwords pricing is like an auction based system). Facebook knows that a lot of people search for ‘interests’ related to engagement rings but other than the historical data they have and the number of advertisers willing to run ads related to engagement rings, they don’t know how much it really takes to make a sale. That’s the primary reason why the average cost per click on Facebook is much lower (at the beginning) compared to adwords. As a Facebook campaigns grows, it gathers more performance statistics and the price will gradually go up. There is also a big difference on how the two platforms handle conversions. With Google Adwords you cannot switch a campaign from ‘pay per click’ to ‘conversion optimiser’ from the beginning. You can only do so after you had some consistent conversions for a number of days. Google is using this information to calculate the suggested CPA for your campaigns. With Facebook, you can start with website conversions from the beginning without having any historical information about conversions. As explained by a Facebook representative I had to the chance to talk with a couple of months ago, the Facebook algorithm is trying to calculate the optimum OCPM based on a number of factors that have to do with the audience and their interactions with the ads. Their goal is to generate conversions with the minimum possible bid and that’s why even if you set a high bid at the beginning, the campaigns will not use it all at once but gradually. 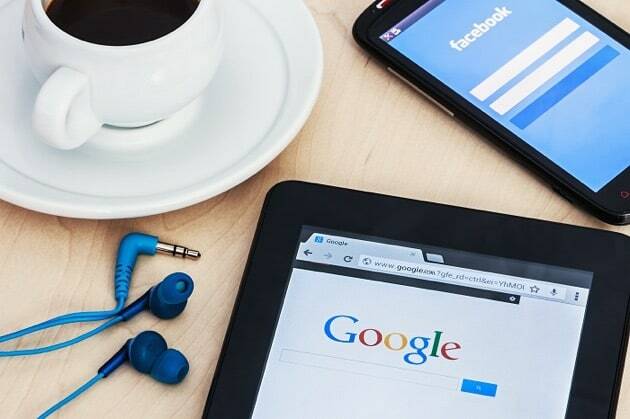 Going back to the above example, despite the difference in the initial CPC or CPA cost, the only way for you to find out which platform is best for your products is to compare the actual CPA on both Adwords and Facebook and decide which one is profitable for your business. As a general rule, any PPC campaigns (on Google, facebook or other) that generate profit are good and more money should be invested and any campaigns that are not profitable should be paused or changed. In many cases I found that the cost of getting a click from Facebook ads is less compared to adwords but the cost of acquisition is less in adwords. Despite this, Facebook campaigns can still be profitable (this depends on your profit margins) and you should keep them running even if the CPA is more than adwords. Should you use both Facebook ads and Google Adwords? Definitely you can use both as part of your digital marketing strategy. They can be used in parallel and since both platforms have good ways of measuring the return from your investment you can do pilot runs and find out how much it will cost you to get a conversion for your business or client. My approach is to first start with Google Adwords using keyword targeted campaigns on the search network and then with Facebook campaigns with the intention of increasing ‘Page likes’, followed by facebook campaigns for making sales or gaining website visits. The idea behind this is that with Adwords, results can come faster than Facebook so you start to make sales or at least understand your market better. With Facebook ‘likes campaign’ you start to create an audience and win the social proof game. Once this is in place, you can use Facebook ads with a different objective (visits to page, or sales) to test the waters and compare the results with adwords. In my case, I use both. But I prefer facebook ads for bigger budget. Because google ads means our keyword will be listed with other competitors while facebook ads not. Thanks for sharing your experience with Facebook and Google Ads. I prefer Facebook Ads for list building and Google AdWords for B2C & B2B lead gen. You can’t push visitors from Facebook Ads direct to a purchase without a solid tripwire offer, downloadable or webinar. With Google AdWords, you can send people direct to your short form sales page and capture their contact information for a quote or proposal.